Several studies have found that the strong narcotic pain killers used to treat workplace-related injuries actually delay the recovery process and result in huge costs for workplace insurers. If you’ve been injured in a work-related accident in Des Moines, Iowa, be sure to examine the costs and benefits of accepting a strong narcotic such as OxyContin, Percocet, or Duragesic. According to a syndicated article from The New York Times, workplace insurers spend an average of $1.4 billion a year on narcotic painkillers. Since these opioid painkillers are such strong medications, they can be addictive and inhibiting if they’re taken in too high of doses or for long time periods. A 2008 study by the California Workers Compensation Institute found that injured workers who took high doses of the painkillers in question were out of work for 3 times as long as those who took lower doses with similar injuries. In 2010, Accident Fund Holdings, an insurance provider in 18 states, conducted an analysis that found that the use of narcotics results in costs that are 9 times higher than in similar cases without the narcotic. Insurance industry data shows narcotics prescriptions as treatment for workplace-related injuries went up by 63% between 2001 and 2008 alone. Some experts say this is evidence of a larger problem – over-prescription of opioid narcotics. If you’ve been injured in an accident at your workplace in Des Moines, be sure to consult your doctor about those risks before accepting and taking an opioid narcotic. 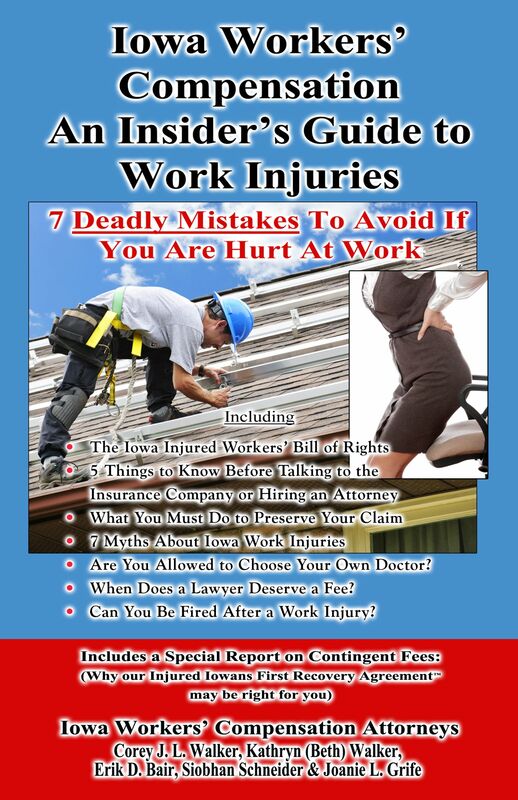 To learn more about workers’ compensation and whether or not you qualify, you can consult our FREE Insider’s Guide to Work Injuries or contact us today. An attorney at the Law Offices of Walker, Billingsley & Bair can help you get the compensation you deserve. Call us today – 1-888-435-9886.